What was once a thriving international airport and the hub for different airlines such as TWA, People Express and Western Airlines along with Continental and United Airlines is now a thriving neighborhood in the city of Denver, Colorado. The Stapleton neighborhood is the largest in the city of Denver and is only 10 minutes from downtown. This unique neighborhood in the heart of the Denver community offers many advantages for those who want to live in modern dwellings that have recently been built and yet stay in contact with the natural beauty that this area is known. From 1929 to 1995, Stapleton Airport was the primary airport of the Denver area, serving the community for over 65 years until replaced in the mid-1990s with the land being turned over for residential and retail development. Located on the northeast side of Denver, the development of the Stapleton neighborhood was based on extensive planning that occurred between 1990 and 1995 when the airport was finally shut down. 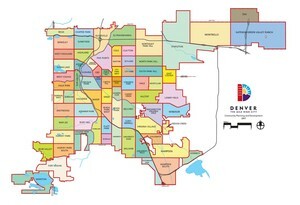 The emphasis by the developers was to create a pedestrian-oriented neighborhood, not an automobile one which many other neighborhoods in Denver were based around. With one third of the 4,700 acre space devoted to public parks, the rest of the development was divided between retail stores and residential homes and apartment complexes. The official construction began in 2001 and by the end of the decade over 3,200 single family homes, condos, row house and other types of house was completed along with over 400 apartments. Bordered by Aurora, Colorado on one side, the emphasis of the Stapleton neighborhood is to provide a relaxed, family atmosphere where retail shops and residences are close together to minimize travel time. In this manner, a family can do much of their shopping in and around their community which is far more convenient. By 2004, the first apartments were being occupied and businesses began growing along with the establishment of the Denver School of Science and Technology. Shopping opportunities also grew when The Shops opened up at Northfield Stapleton. It’s not one thing that makes Stapleton special, but rather a combination of location and emphasis on community that makes Stapleton stand out. For residents of this still growing community, one aspect that really stands out is the emphasis on public parks and the outdoors. The 1,100 acres of open space borders both the Sand Creek Regional Greenway and the Bluff Lake Nature Center, which is one the US’s largest wildlife refuges located in an urban area. This emphasis on preserving nature with the impressive amount of open space is what in large part is drawing more people to this region. Today, nearly 15,000 residents call the Stapleton neighborhood home. A testament to the construction efforts and hard work that built this neighborhood, Stapleton stands as a model community in Denver, providing impressive shopping, plenty of offices, businesses and public parks as well as staying in touch with the awe-inspiring outdoors that makes Stapleton a symbol of what Denver is all about.